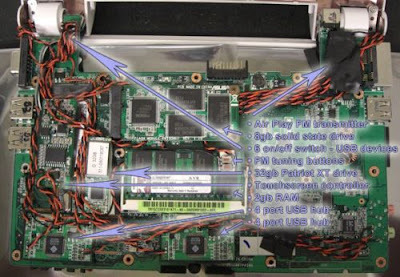 One of the coolest things about the tiny Eee PC is that it’s extraordinarily hackable. You wouldn’t think you could fit so much junk inside of its lilliputian case, but hundreds of people have added touchscrens, Bluetooth, additional memory, and other components to their Eee PC units. If you’re not an expert with a soldering iron, or if you’ve got better things to do with your time than mod your own Eee PC to perfection, one hacker has a proposition: Buy his modded Eee PC on eBay — for $3000, give or take $2000. The starting bid is set at $2800, and the auction has a Buy it Now price of $3200. So what do you get for your money? Apparently the laptop now weighs “less than 3.5 pounds,” which is nearly double the unit’s original weight. You can find more pictures at the seller’s blog. So far this little auction has gotten a lot of attention, but hasn’t attracted a single bit yet. Because to be perfectly honest, if you’re willing to spend that kind of money on a light weight ultraportable, you might as well pick up a Macbook Air which has a far more powerful processor. The Eee PC is still stuck with a 900MHz Celeron processor. And no matter how much you overclock it, it’s not going to perform like a dual core CPU.